GREEN BAY (AP) -- The Green Bay Packers have struggled offensively the past few seasons. Now we don't know how the rest of the season will go but right now it seems as though Green Bay is back on pace for their previous success we know them to have. With the drafting in the first round of LT Karmah Wilder out of Oregon, the offense has a new life. "I'm just happy we are winning games and running the ball well so far. Coming in here, all I can do is earn respect from my teammates and show them what I can bring to the table. I couldn't be happier with where I was drafted," Wilder said in last weeks post-game interview. "And Sean Moorhouse is a freaking beast," he laughed. The Packers are just now off to a 4-1 start, but HB Sean Moorhouse has accumulated over 1,200 rushing yards all ready. It may be weak opponents, and it may be a stout Packers team this season. We'll continue to minitor their progress. PHILADELPHIA (AP) -- They may be off to an 0-5 start on the season but Philadelphia isn't ready to let the season slip away. They announced the signing of a new head coach this week. The common belief across the league is that the franchise is ready to turn over a new leaf and that they are ready to win at all costs. "I'm dissapointed with how things have started but I'm also excited about the changes being made. I think it was time for some changes across the board. I still think we have a great team, we just need to gel better out there, and to be honest have some better play calling." 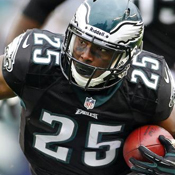 HB LeSean McCoy seemed a little upset with how things had been going in philly. The good news for the Eagles is that the Redskins are currently in first place of the division with 3 wins. It's not too late for them to charge back and make a showing of it in the NFC East; or is it? Who was the best XML QB in 2014?